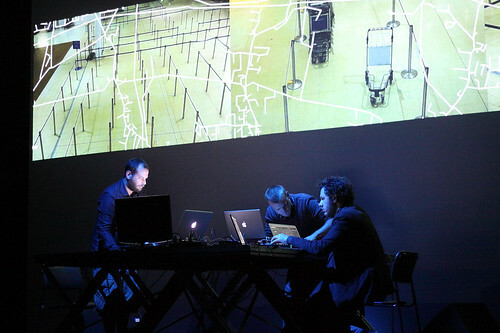 The Light Surgeons are a London-based collective of multimedia artists set up by Christopher Thomas Allen in 1995, and it was he who introduced both premiere performances of their 35-minute-long audiovisual performance LDN-Redux in São Paulo on 23 July 2011, writes Catherine Dixon. The narrative is at one level very simple – a 24-hour cycle of London life – though the multi-layered presentation is anything but. Video, graphics and music are mixed live on stage and projected above the three digital performers – Allen, Jude Greenaway and Tim Cowie – and all their technical kit, so that process and projection are in equal evidence before you. 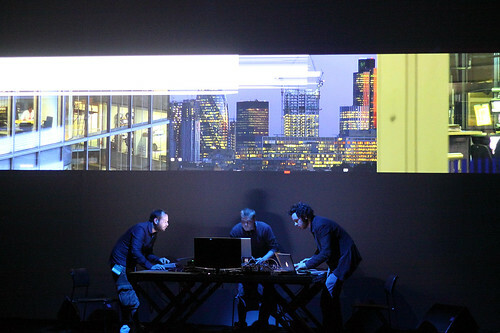 Above and below: Jude Greenaway, Tim Cowie and Christopher Allen performing LDN-Redux (left to right). A ‘remix’ of their recent LDN24 installation project at the Museum of London, the 24-hour narrative becomes the holding structure for a million other stories to emerge, both on screen and in the imagination of the viewer. A tiny red dot crosses the screen to form a simple graphic timeline, the only consistent visual element throughout. At times the full width of the screen is focused on just one visual element, though more typically the screen is divided into horizontal sections, creating sequences of windows into simultaneous yet different graphic worlds or multiple repeat units, abstracting form and emphasising time and texture. All of this technique serves to reveal often invisible information structures and to render the familiar anew. We laugh at the speeded-up sequence of the disembarkation machinery at an airport wrapping around the plane as though it was alive, and at the sequences of pirouetting kebabs. And all the while the city is processing people and processing its waste, we start to understand the piece as akin to a biological portrait of the bodily functions of a metropolis. But not just any metropolis. The colour palette was beautifully observed, the particularly yellow tinge to the lighting reminding me how different is the Pantone profile of my current São Paulo city context. And such accuracy in the detail defines this very specifically as a piece about the uniqueness of a city identity and a space for the individual. Through the bustle and flux of city transit the performance also captures a sense of the city as a space for rhythm and reflection, whether through the strokes of the solo swimmer in their lane, the meat-worker taking five, or the hairdresser lost to her thoughts. Yet the performance never strays into the sentimental. On the stage before me was a city I recognised, both for the good and the bad. Such resonances are drawn together through the sound component of the performance and forwards towards the dénouement. The projection opens up to full screen as a new day dawns and, as the film fades, the final image, from agency Space Syntax, shows the city as circulation system. They may be called the Light Surgeons but what I was left with was so much more than a clever experience of light. And as much as I have described here now, as every show is mixed entirely live, no two performances will be the same. 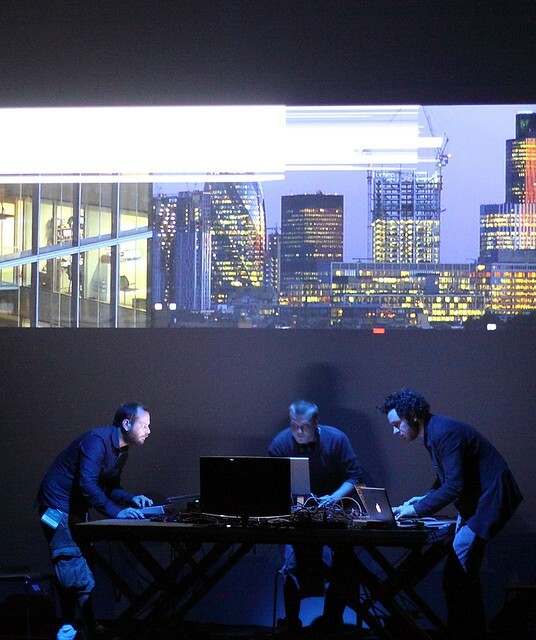 There really is no substitute for seeing LDN-Redux performed. However, if you live in London you can at least get a taste of the Light Surgeons’ installation work in the Voyagers Gallery at the National Maritime Museum, which opened last month (see ‘Sea of information’ on the Eye blog).